When I first discovered Herzog & de Meuron’s ‘customized architectural work’, I was living in London. 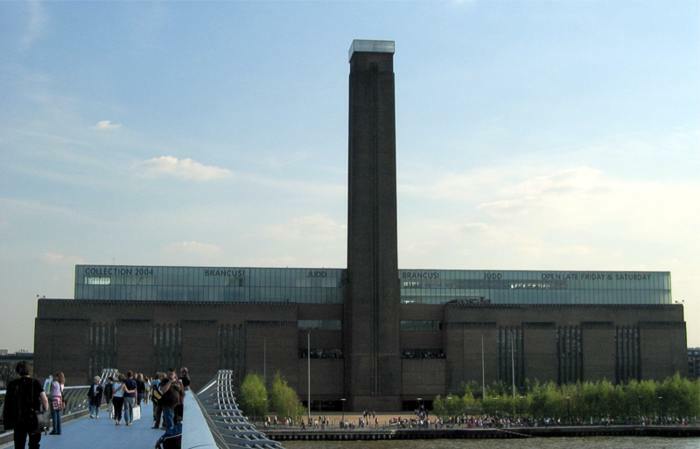 I remember entering the Turbine Hall at the newly converted Tate Modern. That was in 2000; and we were stepping into the 21st century! The first feeling was close to the one of entering a cathedral, where one is overwhelmed by first a cavernous smell, and second a sense of enclosed space; feeling the negative space delimitated by a solid structure as opposed to feeling the building’s walls. From the side entrance (which I recommend if you are a first comer) the slope gradually descends towards the center of the ‘mine’, which is accentuated by its huge head room. I remember thinking: What a luxury of space ! (something I’ve never seen before in a gallery). And then, higher up, you discover protruding blocks coming out of the left wall, as if suddenly you are outside looking at a building! These blocks have big openings with window areas in aqua colour, giving again a futuristic sense (remember, we are in 2000!). Now imagine that behind that wall are the exhibitions venues. But you are not thinking about the exhibits yet, you are experiencing this gigantic hall! Herzog & de Meuron made a point of redesigning the power station: expressing architectural qualities of the old building as well as the qualities of the space in the purposely converted art gallery. Two of their new converted buildings will be unveiled in HK in the coming months. I wonder what they have ‘in the bag’ for the future M+ Museum for Visual Culture and the Tai Kwun Centre for Heritage and Arts? !